Give your barrels the identity they deserve. From acquisition to disposition, you will be able to plan, track, and understand what is going on with (and in) each and every one of your barrels. You have a heavy investment in your cellar, in both assets and product. Our tool helps manage it. 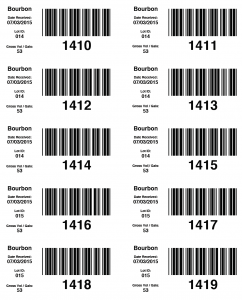 We start by uniquely identifying each barrel when you first receive them and generate an ID label to affix to each barrel. This ID stays with the barrel and lets us track everything related to it while it is in your possession (and even when it has gone on to become a planter). 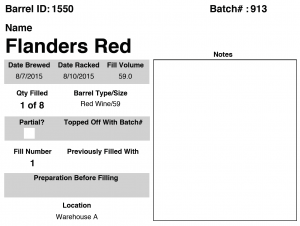 As barrels are filled, we track what goes in them and print out more detailed batch information labels. 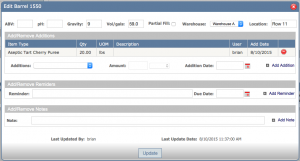 Then later (at the barrel or group level) we can track raw material additions, update lab stats, change locations and warehouses, set reminders, and add notes.